On Friday, NASCAR had a few issues in the inspection line. Then on Sunday, pole sitter Kyle Larson was relegated to the back of the field and his car chief was ejected due to inspection failures. These inspection hangups were mostly due to a change in the inspection process. NASCAR used a 4′ straight edge to tech the splitters of the race cars. In previous weeks, some teams had discovered a way around the rulebook by using shims on the bodies the warp the splitter in certain areas. On Tuesday, ahead of Dover, NASCAR engaged in a conference call with the teams. They stated that they would be placing focus on the splitter and gave clear warning to the teams. Despite that, the Monster Energy NASCAR Cup Series field still showed up to the race track with splitters that weren’t in compliance. So, NASCAR enforced the rulebook and several teams were bitten throughout the weekend. “I love that. And I’ll tell you why,” Kevin Harvick opened up his response on his ‘Happy Hours’ radio show via Sirius XM NASCAR Radio. 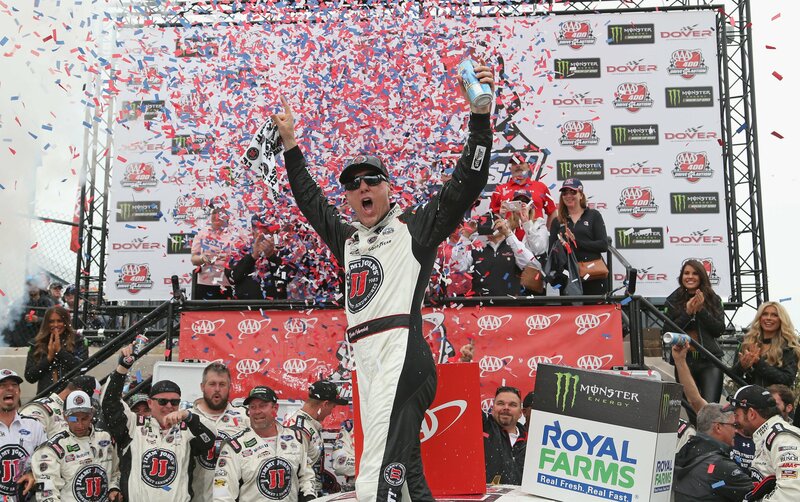 Kevin Harvick went on to win the race at Dover International Speedway on Sunday.